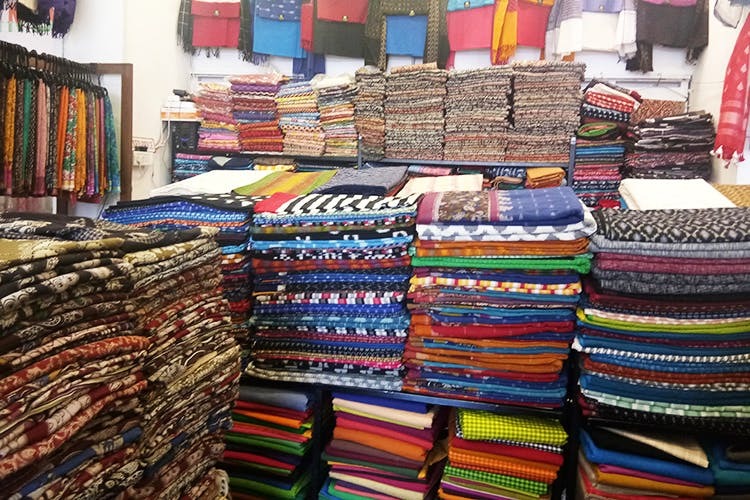 Just a hop, skip and jump away from main Commercial Street, Safina Plaza’s Jai Crafts stocks endless stacks of yardage. Satin silks, Mughal prints, fine cottons, and Ikat Silks find a place here. Specialising in cottons of all kinds, Jai Crafts, at Safina Plaza, is popular with women who love to DIY their outfits. Walk in and you’ll immediately be enveloped by racks and stacks of fabrics. There’s an entire section dedicated just to Ikat cottons (INR 250 onwards) and you can get them in pretty much every colour imaginable. You can then turn your attention to rows of cottons in indigos, whites, browns, oranges and greens. We also splurged on the Mughal Prints section where you can spot prints of all kinds in pleasant, breezy colours. Looking for some fine fabric for a pretty kurta or a lehenga or even a lovely dress? Take your pick from their Ikat Silks. These come in gorgeous purples, rani pinks and ambers and worth every penny you pay (INR 850 onwards for a metre). You’ll be the talk of that next wedding for sure. If you are aiming for a chic, classy look, then, the deep-hued Satin Silks will work best for you. The prices, we admit, are a tad higher than other Comm Street shops but we think they have better variety and deliver good quality too. Jai Crafts also has a branch in Jayanagar, called, Pranjal Jai Crafts.